The Samsung Galaxy S10 and S10+ have leaked again, but this time we’re getting our best look yet at the upcoming flagship smartphones. 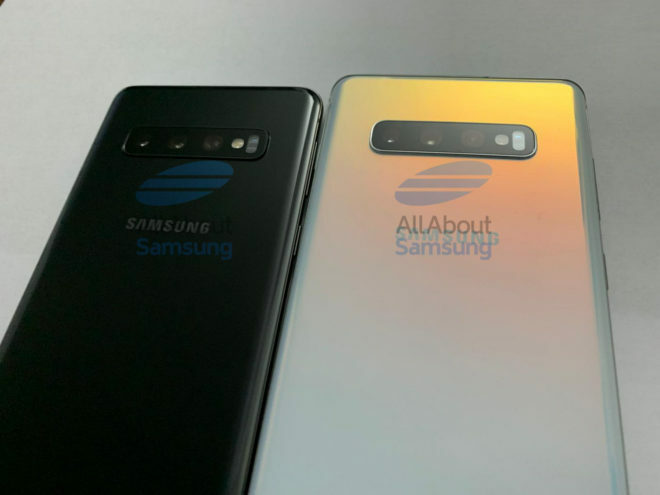 New photos from AllAboutSamsung show the Galaxy S10 and S10+ from several angles. We get a clear look at the front of both phones, with the S10 boasting a single camera hole-punch and the S10+ packing two front cameras in its hole-punch. We can also see slim bezels around the displays of both phones. Around back, both the S10 and S10+ have a triple rear camera setting. Both phones have also ditched the rear fingerprint reader found on the Galaxy S9 and S9+, which seemingly backs up the rumors that Samsung will switch to an in-display fingerprint sensor for the S10 and S10+. On the bottom of both phones, we can see a USB-C port for charging and a 3.5mm headphone jack, which is exciting for folks who are upset about that jack going missing from other smartphones recently. 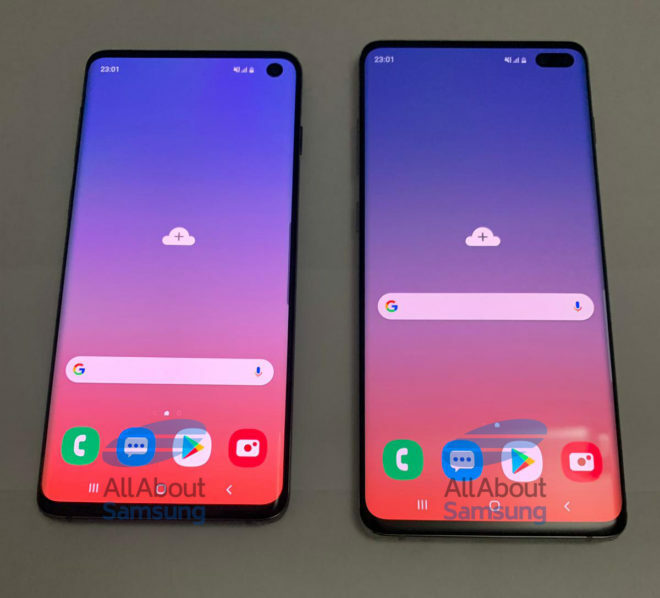 We’ve seen quite a few Galaxy S10 leaks recently, but this is the best one we’ve gotten yet, giving us a clear look at the hole-punch display of both the S10 and S10+ and also confirming that both phones will retain the 3.5mm headphone jack. While there’s no word yet on any T-Mobile availability for either the S10 or S10+, T-Mo has sold Samsung’s flagship phones for several years now, and so it’s very likely that these new Galaxy S models will make their way to Magenta as well. Samsung is holding an event on February 20, and it’s widely expected that the new Galaxy S10 phones will be officially announced there. One plus 7 be here end of April beginning May 7t will be in November I have the 6t and love it gr8 about updates even with T-Mobile slowing updates down. Never buy samsung again. I have a 6T as well and it’s the best phone I’ve ever used…and I’ve used all of them, including iPhone Xs Max. It’s cheap, fast, good display, amazing OS. I do wish the camera would be a bit better but it’s definitely not a deal breaker. Exaggerate much? The 6T is currently $580 with T-Mobile and the S9 is $720. We’re talking about a difference of $140, or 80% of the price, not less than half. It’s not like the S10 will debut much higher than that either. No need to be so sensational. The 6 isn’t available through T-Mobile, so considering the fact that this website is dedicated to all things T-Mobile, I don’t see how that’s a relevant comparison. Of course I’ve heard of unlocked phones, but once again, this being a T-Mobile website, it didn’t seem like a relevant comparison. Also, I buy my phones unlocked directly from the manufacturer, not from T-Mobile. Lastly, what do you care what I spend my money on? I can afford it, no skin off my back. I hear you. Samsung’s make quality phones. Cant compare any other phone to samsung’s camera and screen quality. I just don’t see why samsung’s phones can’t be $200-$300 cheaper than they are. If other manufacturers can do it, why cant samsung? Since there camera and display are built in house.. I think everyone wishes Samsung’s phones were cheaper, but in all fairness you can’t level that complaint against just them. Apple, LG, & Huawei are all priced in the same range. It’s only the smaller companies trying to gain traction pricing their phones lower. Still has a 3.5mm audio jack??? I don’t understand why you’re asking the question. It’s addressed in the article and you can see it in the pictures. I’m just not a fan of the hole. Such an eyesore only for the purpose of minimizing the bezel by another few millimeters. Seems pointless & I’m already fine with bezel sizes as they are. I’m a perennial Note buyer, but if they go this route with the Note 10, I might just hold onto my Note 9 for longer and see what happens next year. This phone is a champ anyway. Rather have the hole punch than a huge azz notch. But that is my opinion. Can’t make everyone happy, they say. I can’t hate on your opinion, but I think we can both agree that neither would be the best option. The Note 10 would really have to wow me for me to look past a hole. I guess we’ll see. So when will the S9 Plus sales begin??? $840 is the original asking price, so shouldn’t it be very discounted by now with a new phone around the corner??? I wouldn’t touch the S10. Not enough timely software support from T-Mobile/Samsung. It’s not a huge ask for a premium product.